December 4, Brasília, DF, Brazil. Click on the image to buy ticket for December 2. Exhibition | Musical instruments and accessories. He’s played and recorded with several artists in Brazil and abroad, such as Ana Cañas, André Abujamra, Baby do Brasil, Chico César, Jorge Vercillo, Belchior, Beto Guedes, Celso Pixinga, Diogo Nogueira, Dominguinhos, Eric Marienthal, Faíska, Filó Machado, Ivan Lins, John Patitucci, Karnak, Nuno Mindelis, Paulinho Moska, Paulo Moura, Peninha, Rafael Bittencourt (Angra), Sá & Guarabyra, Sylvinho Mazzucca, Toquinho and Wander Taffo. He played with the Portuguese singer Eugénia Melo e Castro from 2002 to 2008. In 2004, he recorded the album DES CONS TRU Ç ÃO with the songs of Chico Buarque, with Adriana Calcanhoto, Celso Fonseca, Jaques Morelembaum, Pedro Jóia and Chico Buarque himself. Since 1996, he’s been playing with the Brazilian singer Adriana Godoy, with whom already recorded the albums Todos os Sentidos (2003) and Marco (2010). 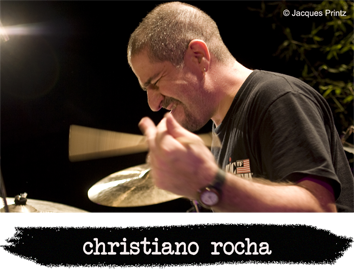 With the bass player Cláudio Machado, Christiano developed the course Baixo e Bateria: Tocando Juntos! (Bass and Drums: Playing Together!). He also released the book Bateria Brasileira (Brazilian Drum); the album Ritmismo, besides the DVD Um par de baquetas e uma camera em Barcelona (A pair of drumsticks and a camera in Barcelona). 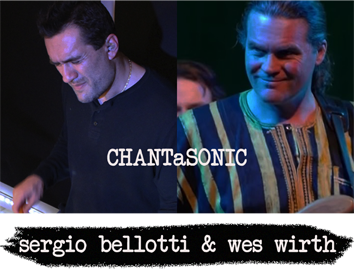 A groove-centered and dynamically fueled duo,exploring the art of chanting through uncensored grooves, soulful melodies, hip-provisations. Sergio Bellotti was born in Bari, Italy, and moved to Boston, United States, in 1995. He’s part of the lively scene music of Boston. He has played, recorded and/or shared the stage with renowned musicians, such as Wayne Krantz, Tom Scott, Bob James, Robben Ford, Nathan East and Dan Siegel. He is currently the drummer for Rock’n Roll Hall of Fame, The Platters. As an educator, he has performed clinics and taught at the esteemed Berklee College of Music. He has performed at international festivals such as the Montreal Drum Fest and Cape Breton International Drum Fest, in Canada; Berklee World Percussion Festival, PASIC and KOSA, in the United States, and PASIC Italy. Sergio and the Italian bassist Tino D’Agostino founded the Spajazzy, a jazz fusion group, which has featured guitarist Mike Stern on both of their cd releases. "Wewh! that bass player is great" said Carlos Santana with a smile as he listened to a recent recording of Wes who regularly performs, teaches, and records in the Boston Area. He’s played and recorded with several artists, such as King Sunny, Chuck Mangione, Rakalam Bob Moses, Darren Barrett, Kenwood Denard, Stan Strickland and Dave Fuze Fiuczynski. Wes is currently producing a feature recording of original compositions that push the limits of contemporary bass-centric sensibility, Super-Sonic. Wes has been a faculty member of the New England Conservatory for decades. In addition to holding an undergraduate degree with honors in jazz performance and composition from the New England Conservatory, Wes runs a thriving landscape architectural and planning practice, he holds a master degree in each of these fields from Harvard University. He makes enormous metal environmental sculptures, and is developing an innovative permaculture research farm outside of Boston. The musical scene is rich in many aspects. It’s not only about the artist on the stage, but also the albums and books they release; the productions they organize; the story they make. In this seminar, three Brazilian musicians will approach fundamental subjects when the goal is to keep the memory of our country; face a very complex market and the challenges they must deal with during their career. He played with several bands from the São Paulo city scene, including the renowned band Titãs. He was the Titãs’ drummer from 1985 to 2010. Still playing with Titãs, he started working as musical and cultural producer. Among his highlight productions are remixing and relaunch of the Secos & Molhados’s albums from 1973 and 1974; he was the curator, producer and coordinator of “Dois Momentos”, a project that included 15 albums; He was responsible for the coordination, production and remixing of the recordings from Caetano Veloso’s most important albums for the box set “Todo Caetano”; worked up and produced the edition of the book “300 Discos Importantes da Música Brasileira”, with the collaboration of the journalists Tárik de Souza, Carlos Calado and Arthur Dapieve. Since 2006, he is the host and director – together with Gabriela Gastal – of the TV Show O Som do Vinil (Canal Brasil channel). She’s teacher and courses supervisor at the IBVF | Instituto de Bateria Vera Figueiredo, in São Paulo, Brazil. Vera has worked hard to divulge Brazilian Music around the world by performing in a number of festivals and giving clinics and master classes all throughout her career. She released the albums Vera Figueiredo & Convidados, From Brasil and Vera Cruz Island; the instructional video Os 40 Rudimentos, and the book/play-along Vera Cruz Island – Brazilian Rhythms for Drumset (Hudson Music). She’s performed in many festivals around the world, such as Percfest Memorial Naco and Italy PAS - Percussive Art Society (Italy), Mendoza International Drum Fest (Argentina), Days of Percussion (Sweden), Cape Breton International Drum Fest (Canada), Kosa International Drum Event (US) and PASIC – Percusive Arts Society Convention (US). Currently, she's playing with the Vera Figueiredo Trio. Vera created the Batuka Brasil and works as curator and artistic director of the festival. He studied at the Drummers Collective (New York), Berklee College of Music (Boston), Conservatório Souza Lima and Clam, where he also was teacher. He’s IP&T (São Paulo) coordinator and teaches drums at Faculdade Cantareira. Launched four instructional videos: Melhore sua Técnica (Improving your Technique), Rudimentos: Como Estudar e Aplicar (Rudiments: Studying and Applying), Volumes 1 and 2, and Conceitos, Estilos e Grooves de Contrabaixo e Bateria (Concepts, Styles and Grooves – Bass and Drums). He’s Bachelor of Music (FAC-FITO). He graduated in Brazilian popular music from UNICAMP and a master's degree in performance from Unicamp. He played and/or recorded with Cacique Jazz Combo, Cauby Peixoto, Celso Pixinga, Derico Sciotti, Fernanda Porto, Graça Cunha, Heartbreakers, Jair Rodrigues, Jair Oliveira, Luciana Mello, Mozart Mello, Nouvelle Cuisine, Paulo Moura, Secos & Molhados, Sandy e Junior, Sizão Machado, Willy Verdaguer e Zérró Santos Big Band, among others. Currently, he plays with his own group, the Quinteto Giba Favery. He also plays with Anaí Rosa Quarteto, Quinteto do Zé, Mozart Mello Quarteto, Dino Barioni Quarteto, Farinha Seca and Havana Brasil. Musician, percussionist, manufacturer of percussion instruments, especially the Cajón. 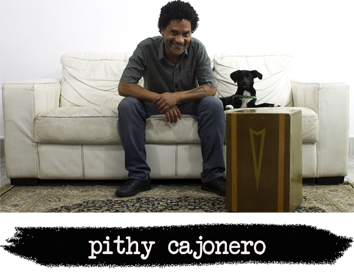 Pithy Cajonero has played with several Brazilian and Peruvian artists, and performed clinics throughout Brazil. His goal of spreading the Cajón culture has highlighted his presence in the media scene. Pithy Cajonero started researching, drawing, creating cajones in a way the instrument could attend the need of the Brazilian music and musicians. From that point, he officially became the Ambassador of the Afro-Peruvian Cajón in Brazil, as well as one of the most respected names in this area. 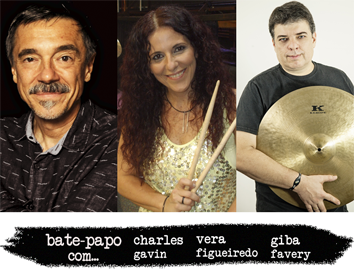 With the endorsement of two of the greatest world specialists in cajones, the Peruvian Maria Del Carmem Dongo and Rafael Santa Cruz, Pithy and his work became reference for percussionists from pop to jazz, from rock to samba, from sertanejo to gospel. 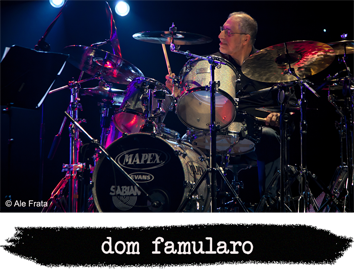 Dom Famularo has been traveling the globe preaching the gospel of drumming for over 40 years. An intense performer, Dom is one of the most respected solo drum artists in the world, with a career built solely upon his unique skills as a drummer, educator, author and motivational speaker. In addition to large drumming expos and clinic tours, Dom is an active educator at colleges, drum schools and camps. He has performed at the Percussive Arts Society Convention (PASIC), Percussion Institute of Technology (PIT) in Hollywood California, Drummers Collective in NY, KOSA Camp in Vermont USA, North Texas State University, the Graham Cole Percussion Camp in England, and Drummers Camp in the Black Forest of Germany and many others. Tutored by legendary greats Joe Morello, Jim Chapin, Al Miller, Charlie Perry, Colin Bailey, Shelly Manne, Papa Jo Jones and Ronnie Benedict, Dom combines the masterful techniques of the past with the parameter-pushing concepts of today’s music for a highly creative and uniquely personal style of drumming. 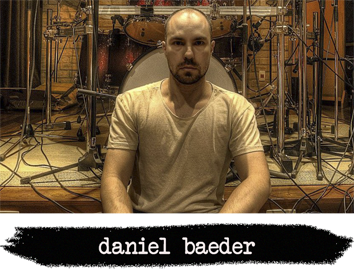 In addition, he is an in-demand consultant to major music corporations, and serves as Education Consultant for Sabian Cymbals, Promark Sticks, Evans Drumheads, Mapex Drums, Hudson Music and Wizdom Media. One of the most popular Brazilian drummers, Mauricio has a relevant solo career. He released three albums, has performed in several other ones as sideman, attending different styles, besides his contribution as musicians and producer in albums, DVDs and TV projects. His instructional video “Técnica! Conceitos & Aplicações” was best-selling in this segment. He wrote and published more than two hundred articles. He was on cover of magazine, and he was the subject of newspaper and magazines articles from all the country. He played with the legendary group V8 and has performed with the trio NUbalacobaco at the most important Brazilian jazz festivals. He has performed around sixty clinics by year, since 1997. He’s already performed in international music fairs, such as Musikemesse, in Germany, and Music China. His group, the Time Out, has released two albums and two DVDs, keeping a dynamical schedule of concerts in Brazil. 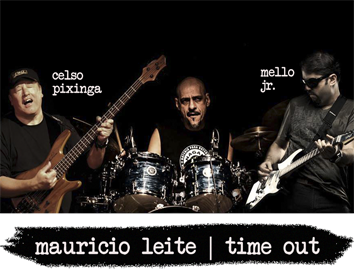 It’ an instrumental power trio formed by Mello Jr. (guitar), Celso Pixinga (bass) and Mauriciuo Leite (drums), musicians recognized by their solo careers and performing as sidemen, as well as studio musicians. They also are highly respected by their work in the didactic area. They perform clinics in Brazil and abroad, attending music fairs around the world. Their first album, Number Two, was released in 2015. It was well received by the specialized media, which took the band to get an intense schedule of concerts in Brazil. During their performances, the Time Out combine odd time signatures, improvising, solos and the musical skill of each member com extreme dynamics and the surprise of the dialogue between the musicians. In 2017, Time Out released the DVD Ao Vivo e de Verdade em São Paulo, in digital and physical format. Click on the image to buy ticket for December 3. Tickets: R$ 60,00. Click HERE to buy. 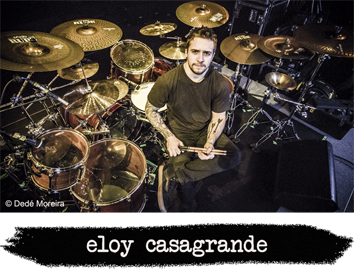 Eloy Casagrande is the Sepultura’s drummer. He became a member of the band he was twenty years old. He was a little boy when his parents noticed his interest by musical toy instruments. At the age of seven, he won a professional drum kit as a reward by an exceptional performance at the end of that year. Every time he performed he captivated the audience because of his meaningful talent combined with his age. It didn’t take so long, and Eloy started performing in TV shows, clinics and musical events. In 2004, he won the II Batukinha! – National Drummers Contest. He performed at the Modern Drummer’s Undiscovered Drummer Contest 2015, in United States, as the winner of the category up to 18 years. In the same year, he performed as guest artist at the 10th Batuka! Brasil. He played with the bands AcllA, Iahweh, 2OIS and Gloria, besides being backup member of the singer André Matos’s band. He started play drums at the age of eleven. When he was eight years old, he watched a concert at his school. After the concert, he asked to the drummer if he could come closer to the kit to see it better, and he said no. This negative answer increased the boy’s curiosity about the drums. Nevertheless, before to embrace the drums, he tried to study keyboard. It didn’t go well. The drums won. He was fourteen when started playing in his first band. Since then, he’s played in several bands. The Metal is his language, in spite of he listens to a variety of artists: Slipknot, Korn, Rammstein, Depeche Mode, Tears for Fears, Sepultura, Pink Floyd, Rush among others. He’s been going beyond with the Metal language. His version of “Delicado”, a chorinho by Waldir Azevedo is quite heavier than the original song. Still, the Metal version didn’t lose its dynamic. 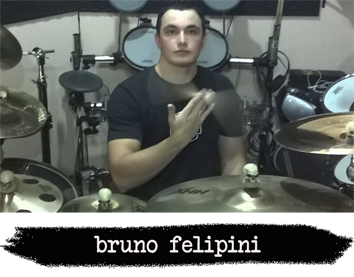 Bruno teaches drums at the Lucchi Felipini Music School, in São Paulo, Brazil. When he was just four years old, Daniel started having piano classes and writing his own songs. At the age of eleven, he won his first drum kit. A year later, he started playing professionally. When he was fourteen, he already taught. At the age of fifteen, he performed as opening attraction during four days of Batuka! Brasil. At the age of nineteen, he recorded a O Terço’s album as drummer and contributing as writer. Since then, he’s been performing in several music festivals around the world; recording and writing for several projects, from theater soundtrack to children’s book; even for TV shows. His career stuck out when he joined the Cirque du Soleil’s first Brazilian creation; the spectacle OVO. He performed as drummer, recorded the spectacle album, even participated of its creation and of many TV shows around the world. 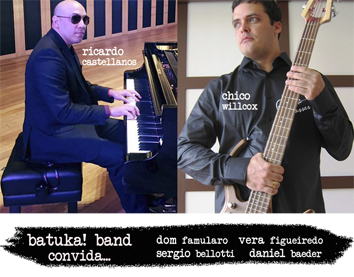 Featuring Chico Willcox (bass) and Ricardo Castellanos (piano), the Batuka! Band invited drummers who are going to perform at the festival for a concert with a diverse repertoire. The guests are: Dom Famularo (USA), Sergio Bellotti (Italy/USA), Daniel Baeder (Brazil/Japan) and Vera Figueiredo (Brazil). He’s descended from three generations of musicians. Chico is a sideman, producer, arranger and solo artist. He has the jazz, the fusion, the funk and the Brazilian music as main influences. He released the album “New Samba Jazz”, by the Swiss recording company Autrisuoni Records. This album had positive reviews in Europe, Asia, United States and Brazil. With the trombonist Bocato, he was responsible for the arrangements for the Orquestra De Camara De Moscow, Jazz Sinfônica and Orquestra Municipal De São Paulo. Renowned by his versitality, he’s played with the Brazilian artists Bocato, João Donato, Guilherme Arantes, Emílio Santiago and Sandy & Junior, Jane Duboc and Toquinho. During his travels around the world, performing concerts or jam sessions, he played with Nguyen Le, Francis Lacius, Dominique di Piaza, Stephen Scott, Gerry Brown, Decebal Badila, Wolf Kerchek, David “Fingers” Haynes, Vast Eye Jackson, Joey Defrancesco, John Riley, Clayton Cameron and Fred Scheneider. He’s recorded with Eliana Elias, Paquito de Rivera, Mike Stern, Jojo Mayer, Lenny Andrade, Emílio Santiago, João Donato, Wolf Kerchek, Romero Lubambo, Vera Figueiredo and Bocato. Ricardo Castellanos was born in Cuba, in 1975. He studied classical piano with Miriam Valdés, Chuco Valdés’ sister, e Danae Ulacia, as well as classical percussion with Francisco Mela e Roberto Concepción. In Cuba, he played with Helena Burque, Omara Potuondo, Xiomara Laugart, Beatriz Marques, Alfred Thompson, Fernando Acosta, Emilio and Efrain Rios, Fernando Ferrer , with whom he was the member of the Raisón, considered one of the best band in the traditional Cuban music scene by international reviewers. Settled in Brazil for more than fifteen years, the pianist has already played with Alaide Costa, Elza Soares, Cauby Peixoto, Jair Rodrigues, Roberto Justus, Guga Stroeter, Hector Costita, Hermeto Pascoal, Bocato, Arismar and Thiago do Espírito Santo, Zimbo Trio, Alexandre Mihanovich, Daniel d’Alcântara, Lito Robledo, Marina de la Riva, among others. 1996 - 2017 © All rights reserved.